This is the first and only book to tell the story of the extremely strong friendships that have linked one remarkable family to literally hundreds of contemporary artists. Miro, Chagall, Mariss, Breton and Duchamp, these are just some of the legendary artists associated with the Maeght family. The original Maeght Gallery was opened in Paris in 1946, today, the Adrien Maeght Gallery is just streets away. 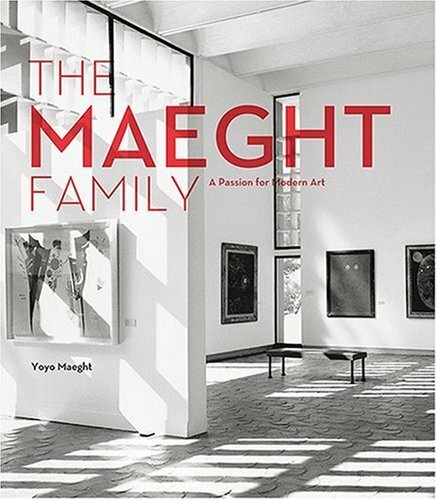 The family started its own publishing business, producing catalogues of today's best known artists, but its best legacy is the Aime and Marguerite Maeght Foundation. This museum in the South of France houses some of the greatest masterpieces of 20th Century art and is an architectural marvel in its own right. Told with an authenticity and in-depth knowledge, here is the story of this unique landmark of modern art. The key moments in the family's life are illustrated with over 300 documents that enhance the text's chronology. Isabelle Maeght joined the family business aged 17 and was responsible for managing personal collections. Today she is General Manager of the Maeght Gallery and is on the Maeght Foundation Board. Yoyo Maeght shares a passion for mechanics, aesthetics and modernity with her father Adrien. She took charge of L'Automobiliste, a Maeght-owned store selling collectors objects. The shop was closed in 1985 to expand the Gallery, where she now devotes her time. Both live in Paris.